Candy Fall Skill Test Redemption Machine is an exciting game that drop the balls into the buckets to win the tickets. Feature with a 32" LCD screen for real-time the video and physical ball synchronization. In the game play, player try to drop the balls into the rotating buckets to win the scores, when more than 50 balls drop into buckets, player win the JACKPOT awards. 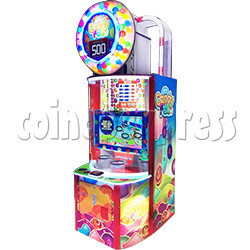 Machine appearance with colorful candy and cartoon style scenes as the design theme, sweet and beautiful. The game play is simple and exciting, only by the push button to enjoy the funny game time. Player insert coins to start the game, the buckets start rotate, player seize the moment to press the push button on the console, drop balls into the buckets to win the scores. Video is synchronized with the physical ball, vivid and interesting. The more balls fall into the buckets, the higher player score, if the number of balls reach 50pcs, player get the JACKPOT reward. Playtime over, machine according to the scores exit the tickets.